Let G be the set of gliders in air, water, or other fluid. Let K be the set of kites. Label the non-empty intersection of G with K be labeled GK or PG. Paragliders as used in paragliding, so far, are members of GK=PG. Let W be the wing set. Let any wing be in W.
That is, W holds elements that may be fully limp or fully solid or any amount of solidity or stiffening between the extremes. W holds also all manner of rotating wings as all forms of fixed or flexible wings. W holds any shape of wing. W holds morphable wings also. Any element of W may be employed in air PGs or water PGs (gliding paravanes). Let w be a wing set employed in a PG; w may consist of one or more elements, even up to high count. Let t be the tether set of PG; t may consist of one element or more up to even high count. Let r be the resistive set for PG and note that r may consist of one element or many elements up to high count. Tension in t brought about by falling/kiting of r in reaction to actions of w in media (air, water, gases, liquids, flowing matter) together with passive or active controls may be configured to give effective gliding. 1. Take the wing of a 747 airliner. Have one or more tethers to that wing. Hang at the bottom of that tether set a mass that fits purposes. Set the complex into free air for a falling and watch the paraglider do its gliding. Have any manner of controls: string control to aerodynamic surfaces, electrical wire sending signals and power to servos on the wing, radio control of servos, etc. Many choices for passive or active controlling of the paraglider. 2. Take a wing from a gyroglider. Tether that wing to a hung mass below. Set the arrangement in fall and see the paraglider occurring that has a vertical-axis rotary wing. 3. Take flip-wing and bridle at the ends of its rotation axis; hang a resistive mass via a tether set (one or more lines). Set this in fall and have a horizontal-axis winged paraglider. 4. 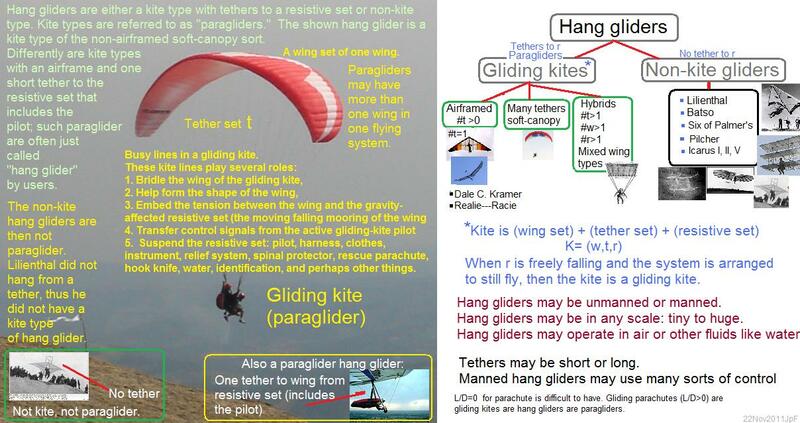 Take a set of power kites and stack them with tethers for a wing set; tether the stack or train of wings to a lower hung mass driver; set the total metakite into fall in air and have a paraglider with multiple wings. 6. Be a spider; spin some silk and shoot the silk up into updrafts; hang on. When you are lifted about and the undulating wafting set of lines play the role of both wing and tether, then know yourself, Spider, as a paraglider in a paraglider. I am glad to share my joy with my friends here in this forum, as you have played a part in this matter, for sure; and I have deep thanks to those who have participated in the preambles to this joy opportunity. Plus karma nod is one way for you to get onto this flight of joy. I set this tech and its very announcement into public domain, free for any purpose in any arena or space. PS: PGs are elements in a proper subset of these supersets: HGs, Ks, Gs. All above has its water PG analogue. PPS: Feel free to add RATs to PGs to obtain FF-AWECS. FALSE: "Paragliding is an adventure sport featuring lightweight, free-flying, foot-launched glider aircraft that possess no rigid primary structure." Not generally true, as the craft may have as much rigidity as wanted to accomplish particular interests and purposes.